Yet another piece in the set I'm doing for Baby Canvases II. 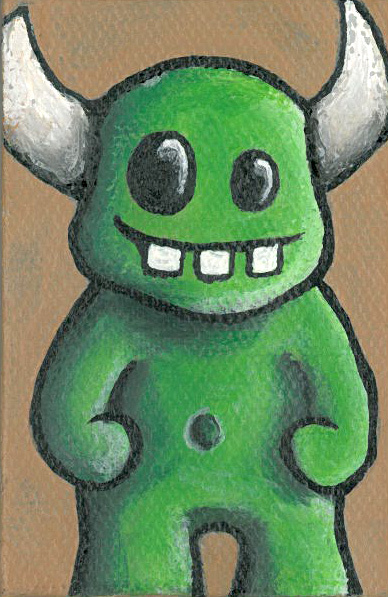 A cute little painting of my little green monster. You've seen his cousin "in the plush" in this post. I'm still getting used to this whole shading in color concept. I've used monotone dry media for so long, that its sometimes hard for me to understand that not just any old dark color will do for shading. I originally tried making the shadows on this little guy in a dark brown. It didn't blend so well, nor did it look too good. So I had to go back over with more greens to finally get it to look how I wanted.